So I don’t know about you guys, but I sometimes get really paranoid about the interwebz. I make a living literally manipulating people to engage online (don’t worry – I never use my conversion voodoo on you guys) – so you can say that I’m part of the problem. But still – I’ve become a bit like one of those crazy old men wearing a tinfoil hat when it comes to what I do with pictures of Bunny. But on the other hand, I never actually stick to my own rules. So really – I’m like a crazy old man wearing a tinfoil hat who takes off that hat when he goes out in public. Or something. Ok that metaphor totally got away from me. Back to the matter at hand. 25 years from now, when he’s interviewing for the job of a lifetime, someone will run fancy facial recognition software on his picture and realize that this man was once a viral internet sensation. And even if Success Kid (I guess he’d really be “Success Man” at that point) gets that job, he’ll still be the “meme guy” at the office. 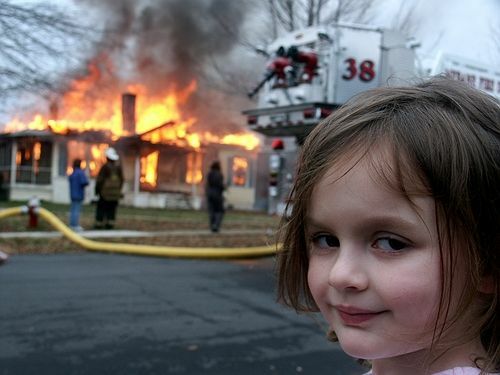 She became a meme because someone happened to take a picture of her when she was making an evil “I may have done this” face with a house on fire in the background and they posted it online because they thought it was funny since it kind of looked like she set that fire. She did not at any point set that fire. Yet one day – when she’s up for the job of CEO of a company that manufactures fire trucks, she’ll be totally screwed. Or if she falls in love with someone who’s got a fire phobia, that would be a huge issue in their relationship. Or if she gets falsely accused of arson – they can totally use this picture against her. Even before Bunny was born Shmerson and I were having in-depth discussions about how many pictures of her we should post online, if at all. I have thousands of pageviews a month on this blog, and he’s a mini “twitter celeb” over here – so he has a bunch of followers. We’re not huge online by any stretch – but we both have our own little bubble of followers – more than the average person. And most of them are people we have never met face to face. Then again – those thousands of people also know our story. They follow us and know what we’ve been through. They supported us through the crap-tastic shitfest that was 2010-2013. They deserve to see the good parts too. Then there’s facebook. Again – we have an issue there. First off – not all of our friends want to see pictures of the baby all day every day. I know how much that used to annoy the hell out of me, and how many closeted IFers and RPLers are on my friends list? And second -we’re literally creating fodder for her to be humiliated as a teenager. Think about it – would you want all of your baby pictures online for the whole world to see? I’m not even going into their privacy policies. Those just make my brain hurt. Then again – she’s our baby, we went through hell to bring her to this world, and we want to shout it from the rooftops. So Shmerson and I sat down and came up with a set of arbitrary rules in a pathetic attempt to protect Bunny, but yet fulfill our duty as proud parents and show her off. When Bunny was two weeks old, we had only posted 4 pictures of her total. Then both Shmerson and I published a status asking anyone who wants to see pics of Bunny on a regular basis to click the “like” button and they would be added to a privacy setting. Any and all pics we post of Bunny are only visible to those people who “opted in”. We’ve also asked immediate family and friends to please ask us for permission before posting any pictures of her, and to keep it to a minimum. We’ve posted 2-3 pictures of her without privacy settings, but most were ones where her face was too small in the frame to be distinguishable. I only post pictures rarely, and I use a watermark that just obscures her face in a way that it can’t be cropped out. At least I hope it can’t. I’m sure if someone really wants to they could lose the watermark, but it’s a lot of work for anyone looking to steal a random baby identity. So I take comfort in the laziness of identity thieves. Denial is a wonderful thing. If Shmerson posts a picture (happens very rarely), he then deletes it no more than an hour after posting. If it has the potential to be a meme – it never EVER sees the light of the internet in any way. That means no funny faces, no obscene gestures, no weird perspectives. Bunny on her stomach, pinky to her mouth, making a very clear “Dr Evil” face. Bunny giving the finger (there are actually several of those). We’ve also stopped posting anything where she is not fully clothed. That people that are now in their early twenties, teens, and younger don’t know a world where there is true privacy. “Generation X” still saw a bit of the cold war. Still studied the book “1984” in school. We take these things seriously. For “Millennials” these things are trivial – a part of life. Of course every minutia of their lives is recorded online. It’s just the way it is. They don’t see it as a problem or a threat. They take it as just another normal part of life. 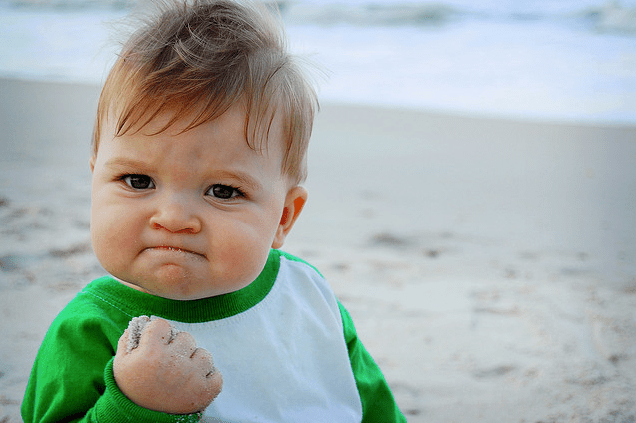 Maybe Success Kid and Fire Girl will actually not have any problems getting hired, or finding a good relationship, or getting their depressive disorders acknowledged despite outside perceptions of their over-confidence. Whatever. Maybe 20 years from now being a meme will be a huge selling point on the job market, and everyone will want to buy you drinks and anti-depressants. We can’t know. So at least for now, Shmerson and I are making a very feeble attempt at finding some balance. It’s a losing battle, we know. But hey – at least we’re trying. And on that note – I give you a glance at Bunny, because we’re overdue. Please don’t make her a meme. I have been thinking about this a lot recently. My husband and I are going to do a “spring cleaning” of sorts of our Facebook friend lists before our baby is born. Instagram is another platform that I think is problematic. So many people I follow post photos of their kids, tagged with their exact location, to the public. I know we will want to share our hard-fought-for baby with friends and family, and Facebook and Instagram are the easiest ways to do so. But we have a lot to mull over first. She is so stinking cute. I love your Facebook plan. In fact, I may “borrow” it. Ahem. We were going to keep pictures of Chipmunk to a minimum, but like you, we want to shout it from the rooftops and we can’t help it! This is tricky. I feel much the same and not too comfortable sharing photos online. There is a lot to think about, at the same time, I want to tell the world about our girl. I like you plan for facebook though!